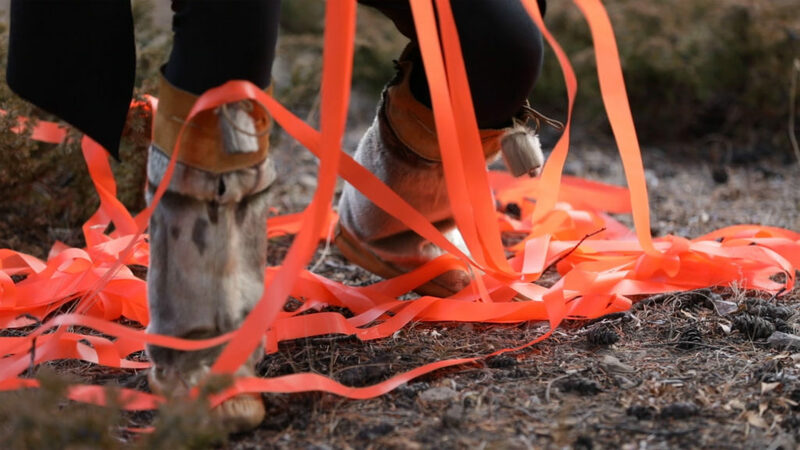 Image: Megan Musseau When they poison the bogs we will still braid sweetgrass; video still. 2017. Indigenous Artists and curators are underrepresented in contemporary art galleries, Artist-Run Centres, and art publications in Canada. The purpose of this Indigenous Curatorial Residency is to provide space and support for Indigenous curators and artists to develop and disseminate their practices. Thanks to the Winnipeg Foundation’s 2015 Community Grant, the Indigenous Curatorial Residency was an incredibly effective project that recentred the work of Indigenous artists and curators and engaged Indigenous and non-indigenous audiences. aceartinc. 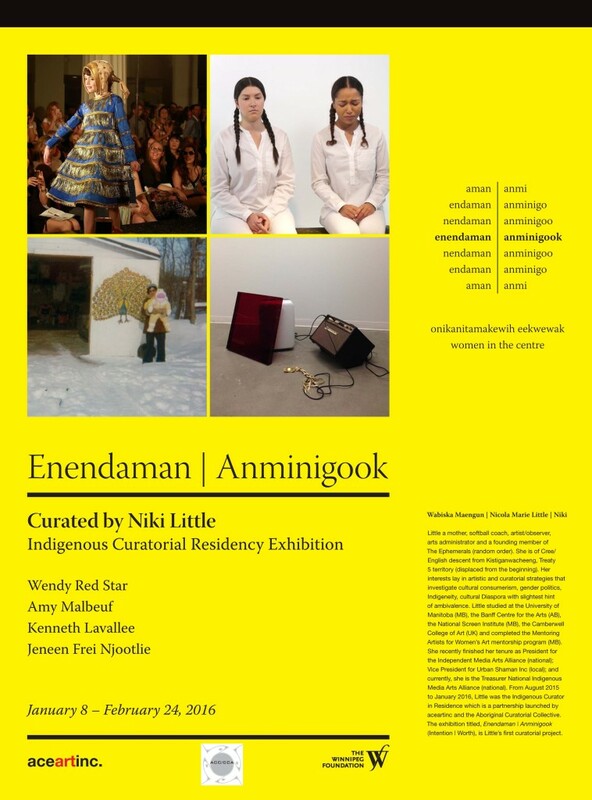 created its first Indigenous Curatorial Residency (ICR) in partnership with the Aboriginal Curatorial Collective (ACC-CCA) in 2015 and Niki Little was selected to be the curator. ICR forms connections to, and between, the city’s Indigenous and non-Indigenous artists, thinkers, and public. The first ICR had a profound impact on ace, not only through the exhibition Niki Little mounted but it also led to a significant increase in applications from (and subsequent selections of) self-identified Indigenous artists to the 2016 Regular Exhibition call. 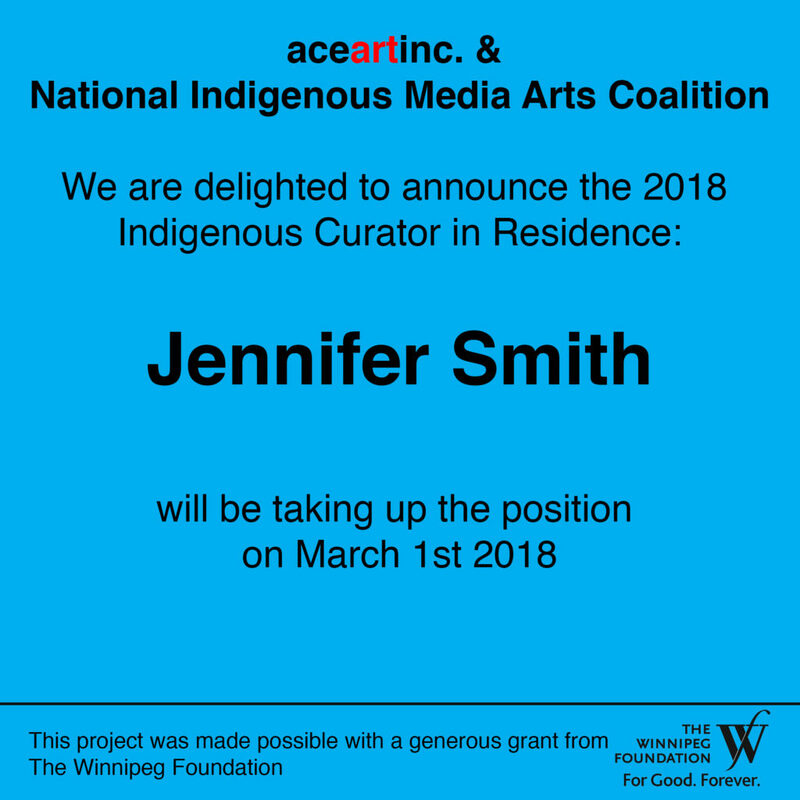 In partnership with the National Indigenous Media Artists Coalition (NIMAC) and with the continued generous support of the Winnipeg Foundation, we are delighted to implement the second Indigenous Curatorial Residency. We are inviting applications from Indigenous curators in Canada wishing to exhibit contemporary artists working in any medium. The curator will be selected by a jury consisting of 2 NIMAC staff/board members and 2 ace staff/board members. We invite applications from Indigenous curators including emerging curators or Indigenous artists seeking an opportunity to curate. The curator will undertake a 6 month residency within aceartinc. from February – July 2018 to work on a specific exhibition. The end of the residency will culminate in the exhibition being mounted in the Main Gallery in July 2018. The curator will be based in Winnipeg and given a workspace in the aceartinc. office where you will receive support from the Director, the Finance & Administration Manager, ace’s board, and the National Director of NIMAC, who is based in Winnipeg. There will also be formal monthly meetings with NIMAC and aceartinc. During the residency, the curator will organize and mount their exhibition, complete the curatorial essay, undertake studio visits with local artists, and deliver a public talk. ace will provide administrative support in terms of office space, access to equipment, internet, and telephone, installation guidance, technical assistance, and introductions into local networks and community. ace will also manage the publication of the essay. The desk and other resources are for the curator’s convenience and will be accessible 24 hours, 7 days a week. He/she/they are not expected to keep strict office hours. The curator (if not currently living in Winnipeg) is expected to spend the majority of the 6 months in Winnipeg in order to work on the exhibition in situ and form strong connections with local artists, curators, and writers and strengthen networks here: a very important part of this residency. However, the accommodation can be flexible in response to the curator’s needs- for example, an apartment may be rented, or a room in a hotel, or equivalent accommodation within the given budget. – Up to $1100/ month towards 6 months of accommodation and living expenses in Winnipeg. We will be accepting submissions by email only. 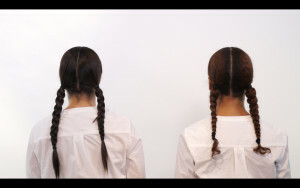 Please send your application to hannah_g@aceart.org, titled “ICR submission”. Call if you have questions- 204 944 9763. You may include up to 20 images presented as one PDF document. No PowerPoint, DVDs, or CD-Rs please. Video may be submitted through a link to Vimeo, YouTube or other accessible websites. Create two separate PDF files: one consisting of your cover letter, artist statement, project proposal, CV, image list and schedule of activities/equipment list. The other file will consist of your support materials. Label the files with your full name. Niki Little was selected by a committee of ACC and aceart staff and boardn (Mylene Guay, hannah_g, Peter Morin, Jamie Wright, Dayna Danger, Helga Jakobson) on June 15, 2015, to be the Indigenous Curator in Residence. She began the residency in August 2015 and it ends in February 2016. Image: Length of Grief; video still; 2016. Amy Malbeuf. Image credit: Jordan Bennett.